As a major sentinel of adaptive immunity, T cells seek and destroy diseased cells using antigen recognition to achieve molecular specificity. Strategies to block checkpoint inhibition of T cell activity and thus reawaken the patient’s antitumor immune responses are rapidly becoming standard of care for treatment of diverse cancers. Adoptive transfer of patient T cells genetically engineered with tumor-targeting capabilities is redefining the field of personalized medicines. The diverse opportunities for exploiting T cell biology in the clinic have prompted new efforts to expand the scope of targets amenable to immuno-oncology. Given the complex spatiotemporal regulation of T cell function and fate, new technologies capable of global molecular profiling in vivo are needed to guide selection of appropriate T cell targets and subsets. 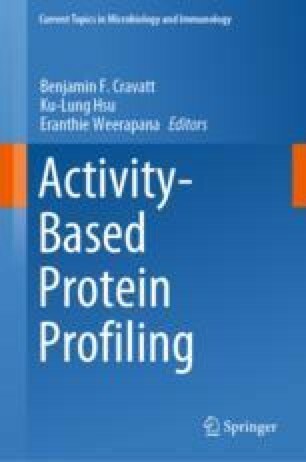 In this chapter, we describe the use of activity-based protein profiling (ABPP) to illuminate different aspects of T cell metabolism and signaling as fertile starting points for investigation. We highlight the merits of ABPP methods to enable target, inhibitor, and biochemical pathway discovery of T cells in the burgeoning field of immuno-oncology.